Duck (ground with bone), Goose, Turkey Liver, Turkey Gizzards, Mixed Tocopherols. 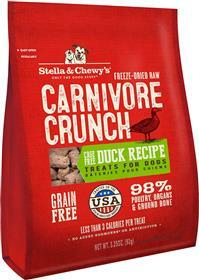 both my dogs and my cats love these treats; the chicken's ok, but there's something about the duck that they go crazy for. easy enough for my cats to break apart and eat, and soft enough for our nearly-toothless old spaniel cross. love that they're all meat too, which makes it great for allergies.